​​Arsenal go into a vital clash against Watford on Monday after a demoralising away defeat to Everton last week. With Spurs and Manchester United winning on Saturday, the Gunners need to re-establish themselves in the top four race and in the process secure just a second win away from home in the Premier League since the turn of the new year. A win over Napoli on Thursday will have raised the mood at the Emirates but that will now need to be followed up with a strong away performance in Hertfordshire. ​Bernd Leno (GK) - Has established himself as ​Arsenal's number one with some excellent performances this season. Will be looking to pick up a few more clean sheets in the campaign, but that will also depend on the shaky backline in front of him. Ainsley Maitland-Niles (RWB) - The youngster has plenty of potential and impressive adaptability, and he's really stepped up in Hector Bellerin's absence. Didn't play well at Everton however, and will need to do better when up against the likes of Gerard Deulofeu and Roberto Pereyra. Shkodran Mustafi (CB) - Not had a great season and should be on his way out this summer but will play in place of the suspended Sokratis. Laurent Koscielny (CB) - He has undergone an incredible recovery at the age of 33 and remains Arsenal's best defender. Was certainly missed against Everton and his worth was once again made clear in the win over Napoli. Nacho Monreal (CB) - At his advanced age he suits the left-sided centre back role in a three-man defence, although Napoli did target him in the second half. Another player to have fought back from injury impressively but his future remains up in the air. Sead Kolasinac (LWB) - A surprise package under Emery that has grown into a really important player with his robust sprints down the left hand side. With five assists in the league he is a crucial part of Arsenal's attack but still needs to improve defensively. Granit Xhaka (CM) - Should return to the side after picking up an injury while on international duty. His importance is often underestimated and with an average of 76.84 passes per game, he is the man that makes this midfield tick. Lucas Torreira (CM) - The Uruguayan has been a really important player for Arsenal all season and was missed during his three-match ban. Came back into the squad with a bang against Napoli and will need to be at his energetic best if Arsenal are going to beat ​Watford. 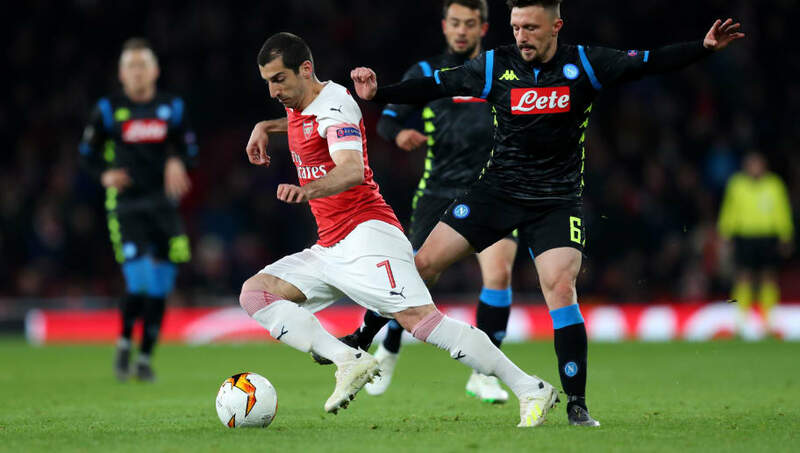 ​Henrikh Mkhitaryan (RW) - Was poor against Everton last Sunday, but with Napoli away on Thursday he may start in order to give ​Mesut Ozil and Aaron Ramsey a rest. He has played well in bursts this season but needs to bring more consistency to his game. Pierre-Emerick Aubameyang (ST) - Arsenal's top scorer had been suffering with an illness but returned in midweek to deliver a good performance for the team. The goals haven't come at quite the same rate since Christmas so he will want to get on the scoresheet in this one. Alex Iwobi (LW) - A young player that has showed real signs of improvement this season under Emery. Still needs to add slightly more finesse to his game but his direct dribbling should cause Kiko Femenia issues.